-This cable has molded connectors and integral strain-relief for durability and long life. -XLR to dual 6.35mm TRS cable is perfect for sending stereo audio to equipments with TRS and XLR connectors. 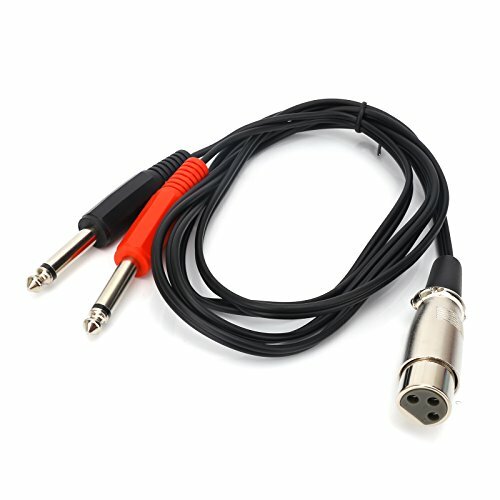 This stereo microphone cable connects a stereo shotgun or condenser mic with a female XLR connector to equipments with 1/4 inch jack; Connect a professional stereo mic to a camera for an interview or to a computer MIC IN port to record a podcast. XLR to 6.35mm cable is perfect for connecting microphones with 1/4 inch jack to DV cameras, camcorders, or other professional audio equipments with XLR connector. Suitable for mic, mixer, amplifier, sound card, KTV, home theater and other environments etc. XLR female adapter output left and right channels. If you have any questions about this product by SiYear, contact us by completing and submitting the form below. If you are looking for a specif part number, please include it with your message.